What's better than fried macaroni and cheese? 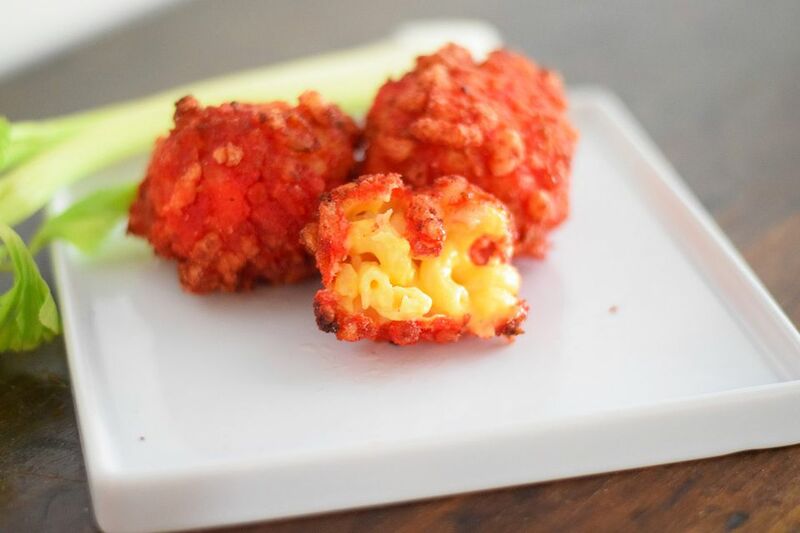 How about Flamin Hot Cheetos crusted fried macaroni and cheese? Two of the greatest junk foods on Earth combined in one incredible snack. They look devilishly delicious and will look perfect on a Halloween snack table! You can make this recipe as quick or as from scratch as you wish. You can use any boxed macaroni and cheese you wish, or you can make your own homemade variety. Any version will work. Just make sure to add the hot sauce to the mac and cheese when you are done preparing it! The Cheetos loose some of their spiciness when they are fried, so the hot sauce provides the extra spice you're craving! Prepare the macaroni and cheese according to the box directions or your own recipe. Mix in the tablespoon of hot sauce until completely combined. Add more hot sauce if you want for even spicier fried mac and cheese! Place the prepared macaroni and cheese in the refrigerator for about 30 minutes, until cooled. Remove the macaroni and cheese from the refrigerator and using an ice cream scoop, form balls of the macaroni and cheese. Place them on a parchment lined baking sheet. Repeat until all of the macaroni and cheese has been formed into balls. Place the balls into the freezer for about 3 hours or until completely hardened. In a food processor blend the Cheetos until they are crushed. Mix in the bread crumbs and about 1/2 teaspoon of salt and pepper. Place in a shallow bowl and set aside. Heat the oil in a large Dutch oven or other heavy bottomed pot to 375 F.
Add the flour and about 1 teaspoon of salt and pepper to another shallow bowl and set aside. Beat the eggs along with the milk and about 1/2 teaspoon of salt and pepper in a shallow bowl. Remove the balls from the freezer. Dip the balls in the flour and roll to completely cover. Shake off the excess and then dip into the egg mixture and roll to completely cover. Then dip into the Cheetos mixture and roll to completely cover. Repeat with all of the macaroni and cheese balls. Place 3 to 4 balls into the hot oil and fry on all sides until they are golden brown for a total of about five minutes. Drain on a paper towel lined plate and repeat with the remaining balls. Serve with extra hot sauce and blue cheese dressing.